Features Coban®, a latex-free, cohesive bandage that is easy to unroll and apply. First layer is a padding bandage made of a blend of synthetic materials that absorbs wound exudate -- a comfortable, non-woven layer primarily provides protection to bony prominences. Second layer is a crepe bandage that anchors and smooths padding layer while absorbing exudate. Third layer is a compression bandage, that conforms to any contour while providing about one-half of compression. Fourth layer is a cohesive bandage that adheres to itself and secures system without tape. Kit contains four bandages and three tape strips. 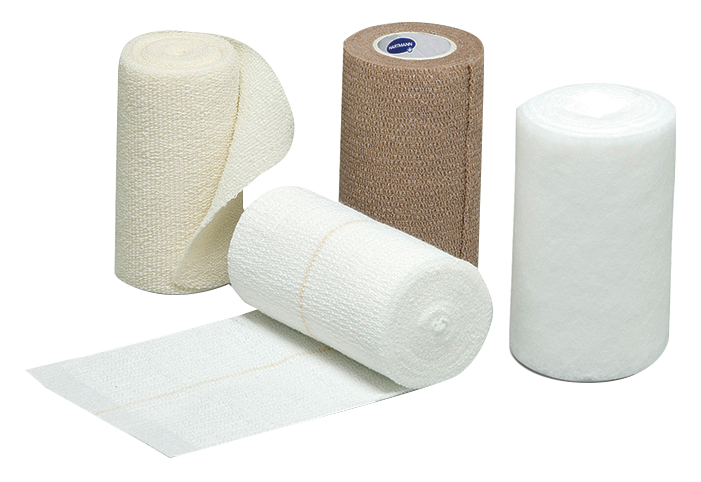 CEB is the medical profession's only choice when a 100% cotton elastic bandage is required. CEB's high-grade cotton yarns are woven to form a bandage of porous, hypo-allergenic elastic, with a non-raveling feathered edge. The rubberless weave reduces the risk of constriction and makes for a more comfortable bandage.